*Yes, I know, but it feels like summer. And Memorial Day is the unofficial start of summer, even if the solstice isn't for a few more weeks. Call it youthful (*cough*) exuberance. Anyway, I hope you and yours have a safe holiday weekend, don't get stranded in any traffic jams, and don't overindulge in s'mores or other grilled goodies. The May program listings have ideas for this weekend (I've highlighted a couple of things below as well) and the June listings are up, too. Most Trails of History sites are open on Monday, May 30, for Memorial Day, but it's always best to check the list to make sure the site you want to visit is on it. Last weekend, the annual 28th Infantry Division Celebration of Service took place at the Pennsylvania Military Museum. 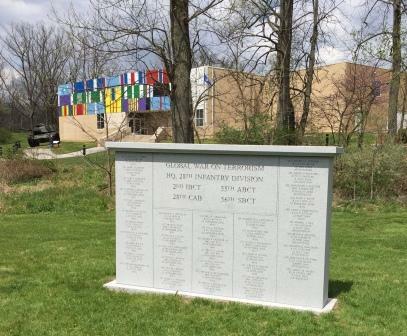 A feature of this year's event was the dedication of a new monument honoring members of the 28th killed in action during the Global War on Terrorism (2001-present). WTAJ-tv covered the event, and you can watch their report to get a feel for the day (and some background on the museum itself). This weekend, PMM holds their annual World War II Revisited program, which features reenactors portraying military field life in the European Theater of Operations, 1944-45. Washington Crossing Historic Park's annual Memorial Day observance is scheduled for Sunday, May 29, at 1 pm at the Continental soldiers' graves area near the Thompson-Neely House (upper park). The State Historic Preservation Office (SHPO) is conducting a public survey as part of a multi-year planning effort. The survey doesn't take long to complete and will help to shape SHPO's efforts in coming years. If you'd like to contribute your thoughts about historic preservation as it affects your community, this link will take you to the survey. I'm not sure how long the survey will be open, so click now and be heard. The Pennsylvania Heritage Foundation has a new website (same address, new look, easier navigation). Check it out! My thanks to the folks at Bushy Run for sending photos of their recent Spring Tea, which looks like it was a lovely event. In an interesting juxtaposition, reenactors portraying British soldiers who were encamped on site in honor of Armed Forces Day marched through the visitor center during the tea (there's video on Facebook, so it really happened). I'm out on the Trails of History most of the week, so I'm writing this Tuesday morning for posting on Friday. Please, universe, no breaking Trails-of-History news before I get back!! As always, you'll find the list of all things (that I know about) happening on the TOH very helpful for planning. And there's the list of sites that plan to be open on May 30 for Memorial Day (not all TOH sites will be open, so it's always a good idea to check). My Google alerts brought me an interesting story, and a detail I did not know (one of many, no doubt), related to a Trails of History site. There is a playground in Sunbury, PA, called Fort Discovery. It was built in 2000 by community volunteers who included elements of local history among the swings and monkey bars. The playground has models of a canal boat, Fort Augusta, and, wait for it, the Joseph Priestley House. Very cool. The article in Sunbury's Daily Item was focused on teens from Shikellamy Middle School who spent a recent morning removing trash and graffiti, spreading mulch, and speaking with a reporter about their fond memories of the playground. Even cooler. Thanks to the students, their teachers, and the playground's co-coordinator, Fran Zartman, for their hard work and for helping children learn about their community while they play. And thanks to the PHMC staff and community volunteers who help keep the full-size Joseph Priestley House in good repair and open to visitors. 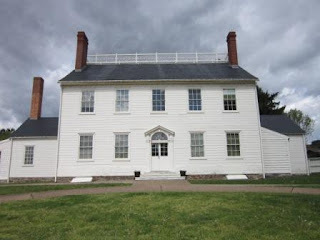 And speaking of Joseph Priestley House and Fort Augusta, you can visit both of them and 9 other sites as part of the 2016 Time Traveler's Passport program offered by the Susquehanna River Valley Heritage Alliance. In addition, the pass encourages visits to see New Deal art at a half-dozen post offices in the region. And Friday the 13th, at that. No reason to feel unlucky when you can enjoy some old-fashioned entertainment. 4th grade students and teachers from Asbury Elementary sang a sea chantey during a recent visit at the Erie Maritime Museum and shared it on Facebook. If you've been following the 2016 Museum Dance Off, the winner will be announced today (5/13) (along with a couple of special prize winners). Visit "When You Work at a Museum" on Tumblr. May 14: Spring Nature Walk—this annual event takes participants on an exploration of the woods and fields around the site; free for members of Bushy Run Battlefield Heritage Society, $5 fee for non-members. No registration required; wear sturdy, water-resistant walking or hiking shoes and dress for the weather. 10 am. May 14: MEET-U in 5 & 1/2—enjoy a 5-mile or 13-mile (half marathon) run through the grounds of Drake Well Museum and Oil Creek State Park and help the museum’s MEET-U educational outreach program. Registration is required; visit the Oil Valley Race Series Facebook page. May 19: Petroleum Program Series—retired General Electric design engineer Rich Hall will present a program on coal-fired generators. Rich has been instrumental in the restoration of two steam-turbine generators (read about it in a past Trailheads post) left in place when Erie's Front Street Generating Station (Penelec) became the Erie Maritime Museum. Admission charged. Doors open at 6 pm, program starts at 6:30. May 15: Site open—Hope Lodge is open the 3rd Sunday of each month through October. Tours of the mansion are offered at 1 and 2:30 pm; cost is $5 for adults and $4 for seniors and students age 6-17 (free for age 5 and under as well as members of the Friends of Hope Lodge). 12:30-4 pm. May 14: Saturday Interpretation—interpreters will provide extra info on a range of topics as you explore the village--The Fabric of Their Lives: Textiles. Included in regular admission, so please start at the Visitor Center. Site is open 10 am to 5 pm; special focus programs available 11 am-4 pm. May 15: Sundays in May—"Open Hearth Cooking" (the cooks will prepare a full seasonal dinner suitable for the Penn family and their guests). Included in regular admission. 1-4 pm. May 15: 3rd Sunday Series—this month's program is "Spring Wildflower Lecture and Trail Walk," led by current and retired forestry staff with Susquehannock State Forest (DCNR). Starts at the visitor center and included in regular admission (free for members). Museum is open 9 am-5 pm, program starts at 1. May 14: National Train Day—activities for all ages will be offered to celebrate the role of railroads in American life. Lots of family-friendly activities, tours of train cars and locomotives, and a random drawing for prizes. Included in museum admission. 9 am-5 pm. May 15: Bookbinding Workshop—Ramon Townsend will teach participants how to assemble a book by hand and create a cover with decorative paper. Suitable for ages 14 and older; limit 6 people. Cost is $75 including all materials and equipment. Payment due before May 15. Call 215/493-4076 for details and to register. I keep seeing interesting things I want to share here, so that's what I'm doing. The May program page is available if you're looking for something to do this weekend. And if you're one of those people that plans ahead (you know who you are), there's a list of sites that will be open on May 30 for Memorial Day. Voting ends at midnight tonight (May 6) for Washington Crossing Historic Park's "Parkitecture" photo contest. They've posted the finalists on Facebook. 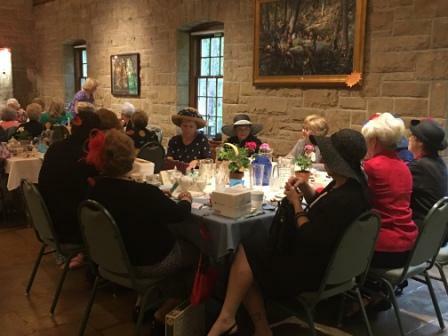 Somerset Historical Center held their annual coopering workshop last weekend. Experienced coopers teach their skills to folks who come from far and wide and leave with a finished (or nearly finished) maple sap bucket (or "keeler" as it's called in Somerset County). Nicole Belolan, a Ph.D. candidate in the History of American Civilization program at the Univ. of Delaware, attended with her husband, Tyler Putnam, and tweeted a number of photos as the weekend progressed. As it happens, Nicole is also a former PHMC Keystone intern. 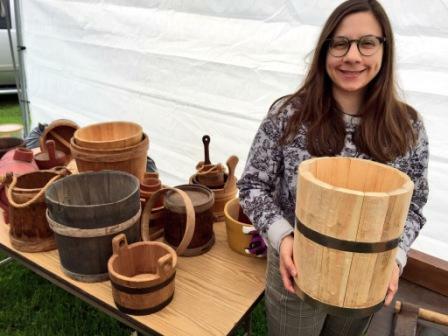 The Somerset Daily American also shared photos from the workshop, which continues to draw participants with a variety of reasons for learning this centuries-old trade. PHMC's info specialist Sean Adkins and PA Heritage editor Kyle Weaver took one of their signature Trails of History road trips last week, visiting Pennsbury Manor. Lots of behind-the-scenes photos and video on Twitter, gathered on Storify for easy viewing. Museum educator Michael Showalter recently spoke with abc27's Amy Kehm about one of Ephrata Cloister's historical personalities, Mother Maria Eicher. Michael explained Eicher's leadership in the community and its relation to Conrad Beissel's belief system. You can watch it here on abc27's website.